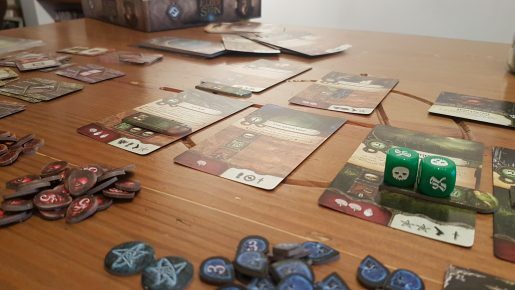 Elder Sign is a fantasy themed, dice rolling, board game from the designer duo behind Arkham Horror, Richard Launius and Kevin Wilson. The game, published by Fantasy Flight Games, sees 1 – 8 players spend around an hour racing against time to stop the release of the ancient one. Set in a museum in 1926, there are plenty of monsters eager to help the ancient one to freedom, certainly dooming the planet. 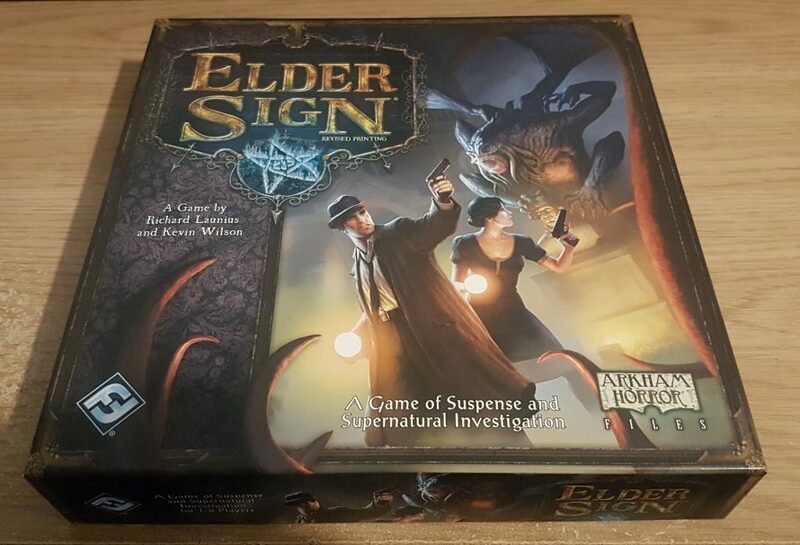 Released back in 2011, Elder Sign isn’t exactly a young game. However, is it still worth taking up the reins of an investigator? Let’s find out! To set up the game there are plenty of token piles to make, investigators to be selected, an evil ancient one to choose, an adventure deck to shuffle and item decks to split out. Based upon the selected investigators, players get starting items and if you wish sanity and stamina tokens. This is somewhat optional as you can use the same tokens to count collected sanity or stamina damage, it’s more personal choice of if you like to see the count going up or down. The starting 4 adventure cards are flipped from the deck and players put their player tokens onto the museum entrance. 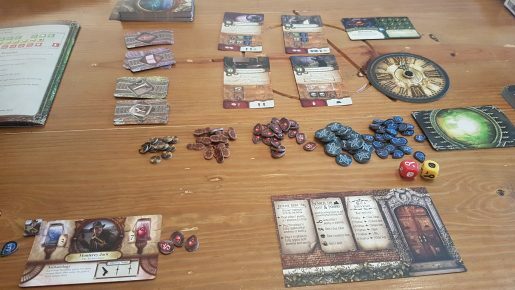 The aim for the investigators sounds a simple one, collect enough Elder Signs to stop the ancient one from destroying the world, before time runs out! To do this players will need to successfully complete adventures, earn signs and items, and importantly not die or go insane. In an attempt to do this players will be taking turns that are broken down into 3 stages: movement, resolution and the clock phase. Movement is effectively where players have to choose which adventure to go on or whether to return to the museum entrance. Note, you can attempt the same adventure as before by staying still. When trying to complete an adventure, the resolution phase, players get handed all of the green dice available, 6 by default. The symbols of the dice match the requirements on adventures’ tasks. By rolling the dice players can see if they have the symbols to complete a task. If they do they cover the task with the dice that completes it, moving onto the next task with the remaining dice – until all tasks are complete and the adventure is successful. If not all the symbols needed to complete a task are rolled then a die is removed from the pool and the player rolls again – until the adventure is no longer possible due to too few dice. As if this wasn’t bad enough, some adventures have terror effects that trigger whenever you fail to complete a task and have rolled a terror symbol. These pesky features add additional challenge, from seeing additional dice lost from your dice pool to completely failing the adventure instantly. Upon winning an adventure players gain the indicated rewards on the adventure card. These come in the form of cards (common items, unique items, allies, spells or Other World adventures) or tokens (clue or Elder Signs). Common and unique items mostly gives players the opportunity to utilize the red and/or yellow dice on a future adventure, these are generally better dice that can turn a hard adventure into a manageable one. Spells are also helpful with the majority allowing the player to save specific dice rolls from one round of rolling to the next, making the next task that bit easier. 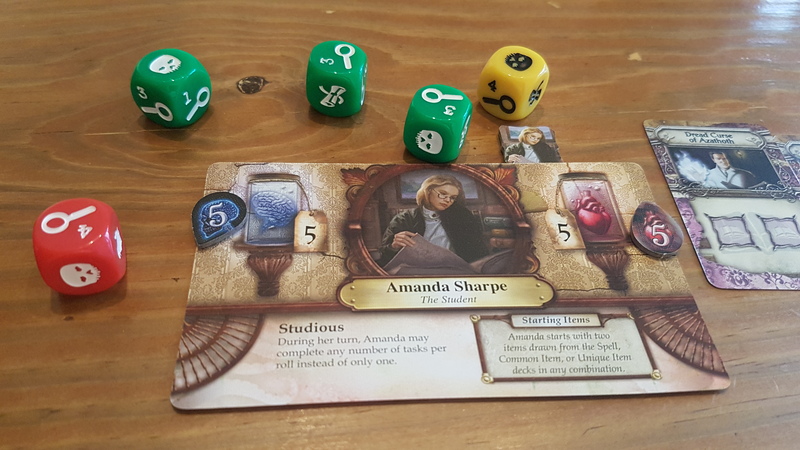 There are a whooping 16 investigators included in the base game, with each having a special ability: be it being immune from terror effects or complete multiple tasks per dice roll. The next card type, allies, offer something extremely similar to these powers – in the form of semi-permanent buffs, until they get taken out. The final card type doesn’t get given to the investigator that completed the adventure, instead it sees a special Other World adventure added into play alongside the 4 standard adventure cards. There are 8 included Other World adventures and often players will find these more rewarding than standard adventures. Clue tokens are brilliant for investigators’ chances, allowing the player to reroll one, some or all their dice when trying to complete a task without discarding a die. The final reward is what investigators are truly after the Elder Signs. Note, while you are earn them individually, like items, the target is cooperatively achieved. On top of items, the player that completed the quest keeps the card. Each has a trophy count that add together and can be spent back at the museum entrance. Instead of going on an adventure players can choose from three actions at the entrance. First Aid is the way characters regain lost stamina or sanity but depending on how much it costs trophies. 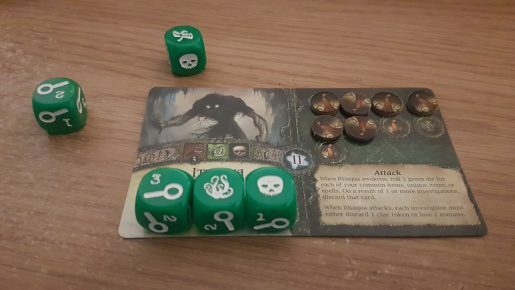 Lost & Found sees the player gamble by rolling a green die, with items on offer for peril, lore and terror symbols whilst damage is awarded for investigation symbols. The final choice is souvenirs which sees players trade in trophies for common items, elder signs and everything between. Remember, doing this is still an action and sees the clock hand move on. The benefits of completing adventures sound great, though when failing there are always consequences, some worse than others. Commonly the player will take damage, stamina or sanity wise, though some will see clue tokens or more lost. The worst outcome adds a doom token to the ancient one’s tracker, seeing the end of the game creep closer. Impending doom aside, adding tokens to this tracker can also see monsters added to the game, adding tasks to cards – often making adventures harder to complete. Monsters can be defeated by completing their task, becoming part of an adventure, still they do offer additional trophies when eliminated. Some monsters and even some adventure cards can hinder players in more ways than one. Having access to the red and yellow dice can make completing adventures a lot easier, given that players have the items to use them. Whenever a yellow, red or even green lock is featured on a card or monster that die is placed there and cannot be used until the adventure is complete or the monster vanquished, giving some urgency to specific objectives. Succeed or fail and once the adventure is over the final stage of the turn is to advance the clock by 15 minutes. Each time the clock strikes midnight a Mythos card is drawn from the deck… and bad things happen. Almost every single card features a caveat that if players cannot fulfill will add a doom token to the tracker. When full the ancient one awakes and the game changes to a battle to the death – remember you’re fighting for the survival of the world here! Forget the museum, and its adventures, as players cannot move from the ancient one’s card – not even to heal. During this battle players actions change to simply attacking the ancient one followed by advancing the clock. Rolling the dice players are trying to match the symbols on the ancient one’s card. Getting the matching symbols allows you to remove a doom token from the tracker, using the same dice rolling process for failing as tasks. After each turn the clock advances 15 minutes but at midnight the ancient one attacks, with the power listed on the card. For example, Hastur deals two sanity damage to each investigator if they cannot discard a clue token; while Shub-Niggurath instantly devours investigators whom cannot discard a trophy. If a player gets devoured they are out of the game and play continues until either everyone is dead and the world is lost or all doom tokens are successfully removed and miraculously the world is saved. Elder Sign uses dice rolling to add tension to the game. Nevertheless, as with any game that utilize dice, at times a sense of misfortune can mar the experience. To limit this affect Elder Sign has elements that help the player convince themselves they are always in with a shot, no matter how bad things are looking. The ability to lock dice in, be it via a spell card or a fellow investigator, is key to this. Get some symbols you need and it shows you could do it, couple this with a clue token rerolls and players forget they may be close to failure. In terms of quality, it is hard to knock the majority of what is included in the box. The cards are of good quality and the art is nice. The only real niggles are that the doom tokens are too small, therefore fiddly, and while the cards are of decent size I’d have loved to see more room left for the artwork to help it shine. There is nothing to complain about on the dice front, as they are of decent quality: thankfully not being reduced in size, despite often having to sit on top of cards – something helped by the increased adventure card size. Alas, the problem is less with what isn’t included in the box and more what I feel a modern release would come with. There isn’t a board or some kind of playmat that would aid set up and give the game a way to have more table presence. There is no draw bag included to pull the monster tokens from, a process which is supposed to be random. There aren’t enough baggies included in the box for all of the tokens after they’ve been removed from the punch board. Finally, there is no tracker for collected elder signs, unlike the doom tracker, instead they just pile up. These are by no means required for the game to play but they’d help to complete the experience, give the game that extra flair and most importantly make a few things clearer for new players. Normally I find that Fantasy Flight Games are brilliant at laying out a rulebook, not only for the first read but also when flicking through to check something you’ve forgotten. Alas, while not a rulebook travesty, Elder Sign’s isn’t quite as easy to flick through, though perhaps this is due to the font being used. Importantly, the rules do step you through each aspect of the game in a logical order, and there is a back page cheat sheet, so the amount you’ll have to return is limited. I’ll readily admit that dice in games often provide me frustration, with a lot of blaming a lack of luck for a loss. Due to Elder Sign being cooperative but this frustration hasn’t appeared to the same extent. Each turn players will be able to quickly select an adventure and start rolling their way to doom or victory. As everyone is working together you stay invested when it’s another players turns, keeping the perceived downtime low. Elder Sign’s issues are making the game call out for a new edition, which would undoubtedly fix the complaints surrounding production. From a gameplay point of view though I cannot fault Elder Sign, especially as there are 8 different ancient ones to battle, each with their own feel. Therefore, for ease of play and a great reason to cooperatively roll some dice, the game does plenty to deserve its space on my shelf!